Is there a technique for avoiding the "mountain bulge" in the middle of the cake when baking? How do you achieve a cake with a flat evenly baked top? I do use these & they yield a flat topped cake. They are also good for baking cheesecakes; they eliminate the need for handling pans of boiling water & the danger of splashing the water into the batter. The secret is NOT to beat the day lights out of the batter when you are adding the flour. FOLD it in, in particula a sponge. Wedding cake bakers do two things for flatter layers: Reduce the temperature by 25 degrees, which helps a lot, and then plan on slicing off the slightly domed top for perfectly flat layers. They have an adjustable frame that supports a "bow saw", but you can improvise with a long, clean hack saw blade and a couple pieces of wood. I noticed those insulating bands on King Art's website. Makes sense...the sides would stay cool and not set before the center. Bjames....when I baked wedding cakes, I cut an old terry cloth towel into two inch wide strips (that's how deep wedding pans are) and then wet them and wrapped them around my cake pans, using safty pins to hold the strips together. The batter would rise up evenly, creating a flat top....I wrapped the pans with two layers of towel strips and they never burned...they would scorch a little, but it worked. I used the same strips for years....make sure you wet the strips throughly and wring them out, then wrap around pans. Turn the cake upside down. The bottom is always flat. warmed in large bowl and beaten till thick like custard. Fold in ½ cup melted butter and 1 cups sifted flour alternating each. bake as you wish, 350 . 35 minutes. 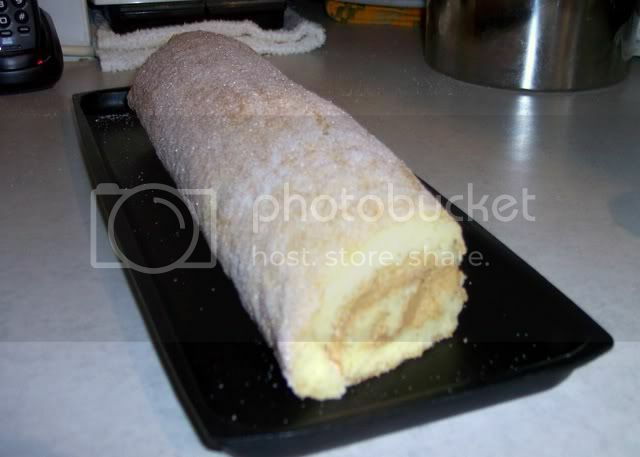 If making Swiss roll. line pan with greased parchment paper, but get it to fit nicely. pour in batter gently and smooth evenly over pan, bake 25 mins check to see if springs back when touched with finger. Do not over bake or it will crack when rolling. remember to work quickly after removing cake from oven.